A video showing a McDonald’s customer hurling a paper bag with food at an employee has quickly spread online, sparking public outrage. It has been less than a month since a clip showing a McDonald’s customer throwing food at a drive-thru employee went viral. The video shows a man arguing with an employee and throwing a paper bag containing food, hitting the employee directly in the face. The man reportedly complained that his food came out late, but had not seen the screen that showed customers’ order numbers, unaware his food was already waiting. 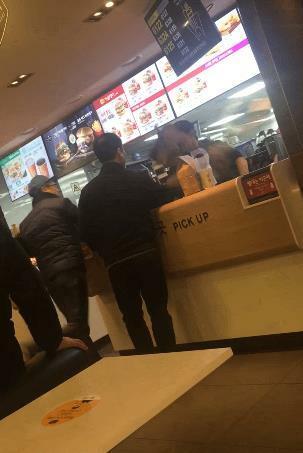 According to McDonald’s, the incident happened about a month ago at a branch in Yeonsinnae, northwestern Seoul. Police reportedly came to the store and settled the matter. The customer is reported to have apologized the same day, after the employee said he did not wish to press charges but wanted an apology. McDonald’s offered therapy to the employee, who was reported to have been greatly stressed after the incident but wished to continue working. Although the parties involved seem to have settled the matter, many online commenters are still enraged at the customer for his “gapjil,” a local term referring to abuse by someone in a higher position. Some have insisted that the customer’s act should be charged as assault with a weapon -- for which the offender could be punished even if the victim does not wish to press charges.